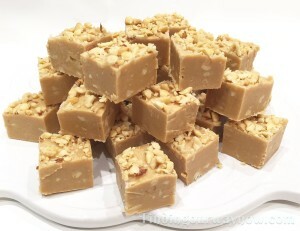 I’ve been working on a collection of fudge recipes for an eBook; peanut butter fudge happens to be one of them. When I was young, I had a real thing for peanut butter or anything and everything that had peanut butter in it. As you might imagine, I was also a huge fan of peanut butter fudge. I do enjoy my easy chocolate fudge well enough. However, my favorite is just plain peanut butter fudge. Whenever I pull out the ingredients to make this family favorite, many warm memories come rushing back. Fudge making was a wintertime activity in our home and peanut butter fudge was one of those often made. With overcast skies, cold temperatures, and rain or snow coming down it was the perfect time to make yummy peanut butter fudge. Besides, who wouldn’t love this sweet treat from your kitchen? Let’s make some peanut butter fudge. Line an 8×8-baking pan with parchment or aluminum foil (for easy lifting). Prepare the pan by greasing the parchment or aluminum foil and set aside. Or use my favorite fudge making tool – a Marshmallow pan well-oiled. Melt the white chocolate, peanut butter chips, sweetened condensed milk and peanut butter in a double boiler (or a heavy saucepan over very low heat). Take your time and be careful not to scorch the mixture, constantly stirring it until the chocolate has melted and all ingredients are well blended. Follow with the ½ cup marshmallow cream, vanilla extract and salt. Add 1 cup of the chopped peanuts and stir until they’re well blended. 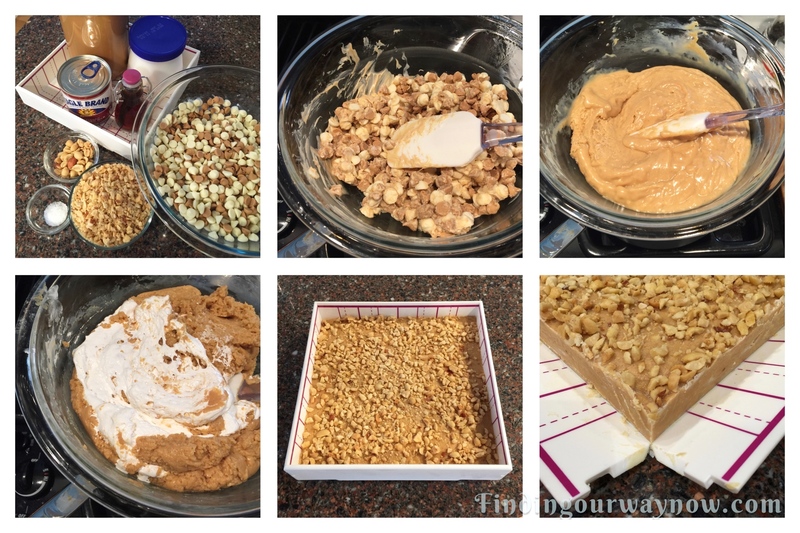 Pour the peanut butter fudge into the prepared pan, spreading it evenly in the pan. Sprinkle the remaining ¾ cup of chopped peanuts on top. Lightly press the nuts into the surface of the peanut butter fudge. Refrigerate the Peanut Butter Fudge until firm. Cut into 1-inch size pieces. Notes: Don’t even think about turning up the heat to speed up melting the mixture. It quickly melts at very low heat with little assistance. Depending on the peanut butter you may see oil that has separated from the mixture and accumulated on the top of the fudge. Not to worry, when that happens I lightly press a few sheets of paper towels on top to absorb the excess oil. There are times the mixture may get a bit stiff; again not to worry it will be okay. If you prefer it a bit thinner, add some cream, a tablespoon at a time to the desired consistency. I usually don’t worry about it. Sometimes that’s the result of the kind of chocolate and baking chips used; most often, too high a melting heat is the reason. The key is to take your time at the very beginning of the fudge making; think low and slow. Here are a few questions for you. 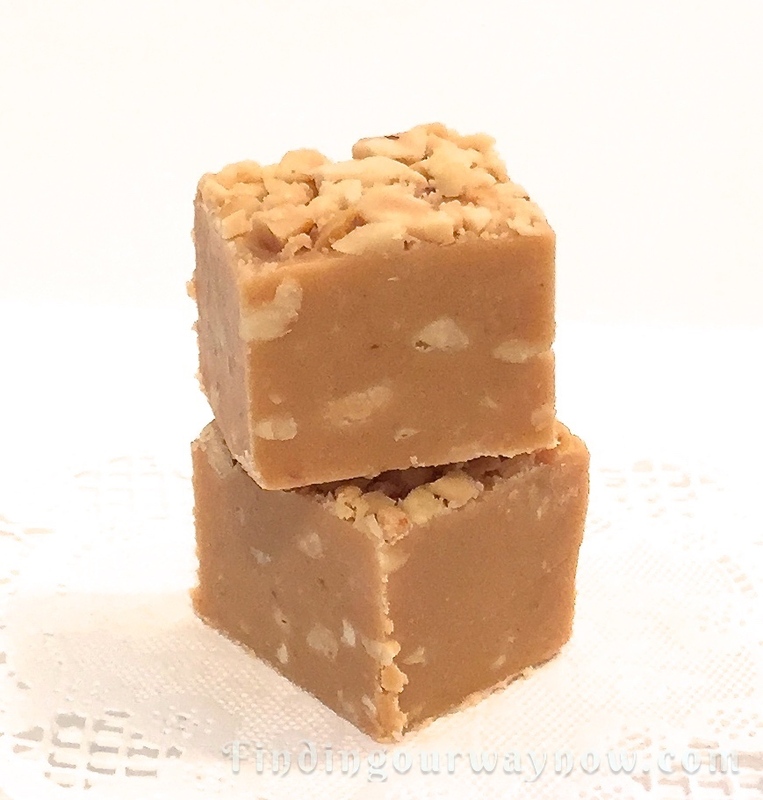 Are you a fan of peanut butter fudge? Do you have a favorite flavor of fudge? 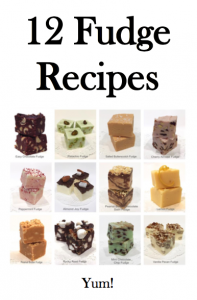 The reason I ask is I have over 12 different easy fudge recipes to share in my upcoming ebook. I’m curious to see if I’ll be sharing one of your favorites. One last thing, coming very soon I’ll be offering a few recipe eBooks exclusively on my website. If you enjoyed this “Peanut Butter Fudge Recipe” and you’re looking for other great treats, check out my Easy Fudge Recipe, Lemon Fudge, and these Homemade Almond Clusters. Enjoy.